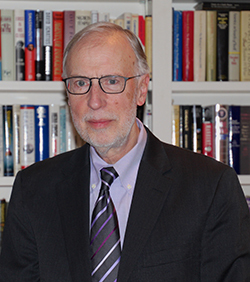 Dan Balz, award-winning chief correspondent at the Washington Post, will visit the S.I. Newhouse School of Public Communications on Tuesday, Sept. 29. He will discuss the 2016 presidential campaign in a question-and-answer session with Joel Kaplan, associate dean for professional graduate studies and professor of newspaper and online journalism, at 7 p.m. in the Joyce Hergenhan Auditorium in Newhouse 3. Follow on Twitter at #TonerLecture. Balz is the recipient of the Newhouse School’s Toner Prize for Excellence in Political Reporting, which he won for a series of political profiles that illuminated the partisan divide in Washington. Former Secretary of State and presidential candidate Hillary Rodham Clinton delivered the keynote address at the award ceremony last spring. Balz joined the Washington Post in 1978 and has been involved in the paper’s political coverage as a reporter or editor ever since. He has served as national editor, political editor and White House correspondent, and as the paper’s Texas-based Southwest correspondent. He is a past recipient of the American Political Science Association award for his coverage of politics and the Gerald R. Ford journalism prize for coverage of the presidency. Also, he was given the Merriman Smith Award for presidential coverage under deadline pressure at the 2011 White House Correspondents’ Dinner. Before joining the Post, he worked as a reporter and deputy editor for National Journal and as a reporter for the Philadelphia Inquirer. For more information about his talk, contact Christi MacClurg at 315-443-7389 or mcmacclu@syr.edu.